I hope this past holiday season was full of joy and good health for you and your families. Lots of important and exciting things have been happening in our community since last I’ve written. Here are just some: It seems that San Diego is on track for a “normal” amount of precipitation, the Los Angeles Chargers had a very successful NFL season but, unfortunately, lost the Super Bowl. The Padres will be starting Spring Training in Peoria this month. The word is out that new uniform colors will be mostly brown, it’s their 50th Anniversary as part of Major League Baseball and the management likes the idea of a “throwback” to the colors of the “Friars” initial season. UCCA has begun its series of podcasts…check it out and let us know what you thin and what you’d like to hear. UCPG’s elected subcommittee, whose responsibility will be to write a new Community Plan have begun this three-year process. Their next public meeting will be held on Tuesday, February 12, 5:30pm at the Campus Point location. A report/update of that committee’s actions will be provided at every UCCA meeting by our elected representative to that committee, Katie Nelson Rodolico. C.A.S.A. (Citizens Advocating Safe Aviation) was recognized by UCCA for their efforts in trying to improve communications with MCAS Miramar and their help with the December 8 Crash Memorial event. At the January 9 meeting, UCCA presented appreciation plaques to Scripps Health, Costa Verde Mall, and Westfield/UTC for their partnership and support of University City community events. UCCF’s Lawsuit: The lawsuit against the City Water Dept.’s plan to construct the two large sewer pipelines through U.C. as part of the planned “pure water” project is tentatively scheduled to be heard for the first time in Court this month. UCCF, under the leadership of Ruth DeSantis, is leading the cause for our community. Ruth will provide a progress report at our February UCCA meeting. LOCAL POLITICS: Barbara Bry, (our elected U.C./District 1 City Councilperson), and Todd Gloria, (CA Assemblyman), have announced/filed their intent to throw their “hats into the ring” for the San Diego mayor’s job. I’m guessing other familiar qualified candidate names will soon be added to the short list. Former mayoral candidate and California Assemblyman, Nathan Fletcher, (who previously resided in U.C. ) was elected/sworn-in to serve on the San Diego County Board of Supervisors. UCPG ELECTIONS: UCPG will be electing a South U.C. resident to sit on their Board at the February/and or March meeting. If interested in nominating yourself, please contact membership chair John Bassler at jbassle1@san.rr.com. UCCA STUFF: At our February 13 UCCA meeting, an important and long-awaited update on the “Imagine UC 2020” project, (new Standley Park swimming pool, jogging path, and performance pavilion), will be delivered by Dr. John Lee Evans, Board of Education trustee. And Ruth DeSantis, UCCF president, will be providing an update on the lawsuit opposing the construction of the sewer pipeline in U.C. These are just two important reasons to mark your calendars and to plan to attend our meeting. 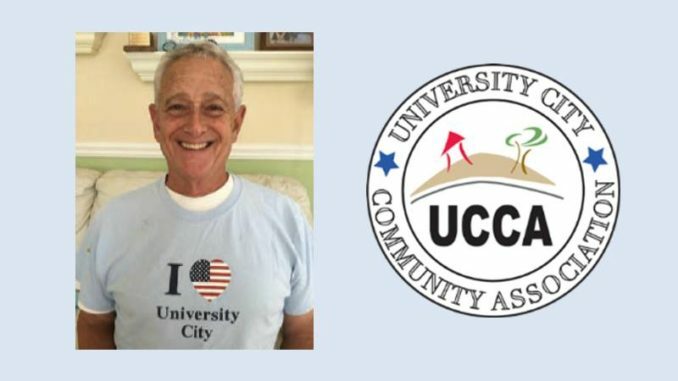 Keep informed, JOIN UCCA at https://www.universitycitynews.org/join-ucca-today/…and remember, University City is “more than just a neighborhood”.